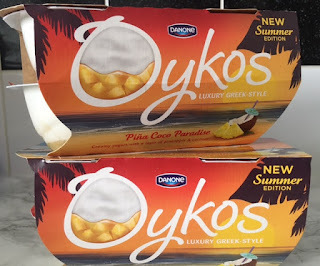 I love Oykos yogurts especially the salted caramel, so I was delighted to try the new exotic tropical inspired flavour Piña Coco Paradise. The amazing smooth greek style coconut yogurt is then followed by a fruity layer of pineapple and soft coconut, and when they are mixed together both of the flavours complement each other, giving a deliciously thick and creamy indulgent yogurt. Piña Coco Paradise is a deliciously indulgent geek style creamy luxury yogurt that both adults and kids alike will love. The new Oykos Piña Coco Paradise is now available nationwide in Asda with an RRP of £2.39.